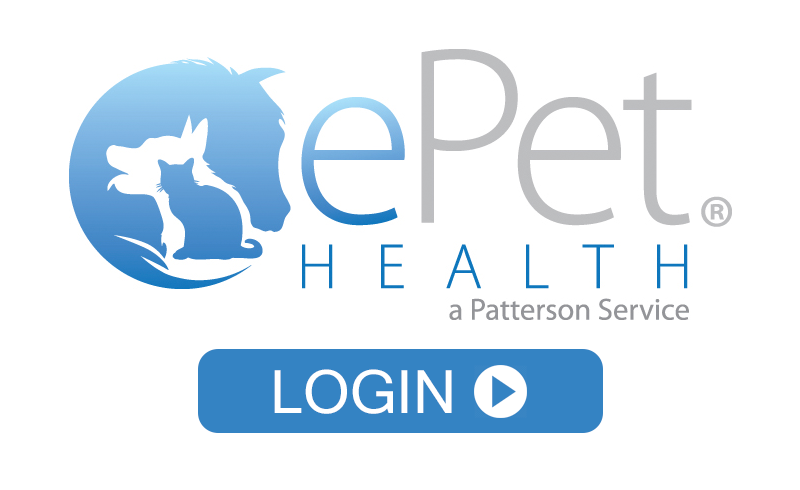 Meet our compassionate team that's here to care for your pet! ​Kelsey is one of our Receptionists at PVH. She has two cats- Gustave and Hugo, two dogs - Iko and Jed (sitting on her lap) as well as a life long love of animals. 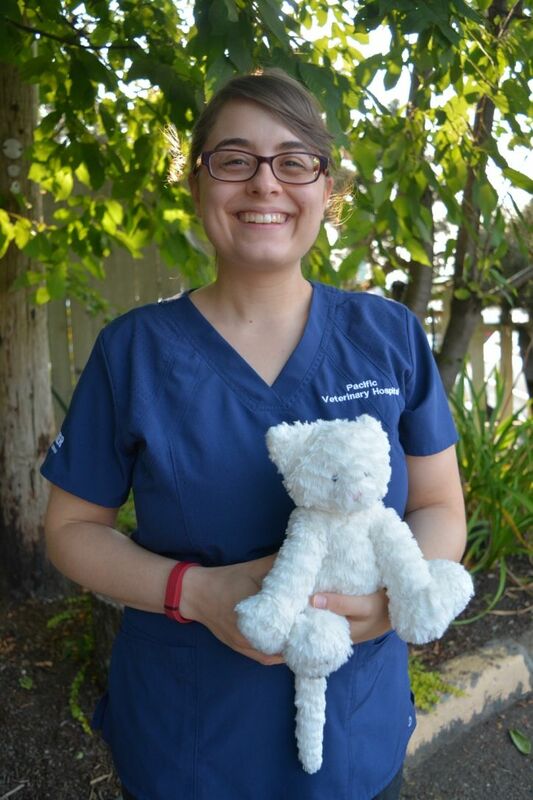 She likes working for Pacific Veterinary Hospital because she gets to meet so many great people and animals alike. Kelsey feels really good about helping our Doctors and staff provide quality health care to our patients! 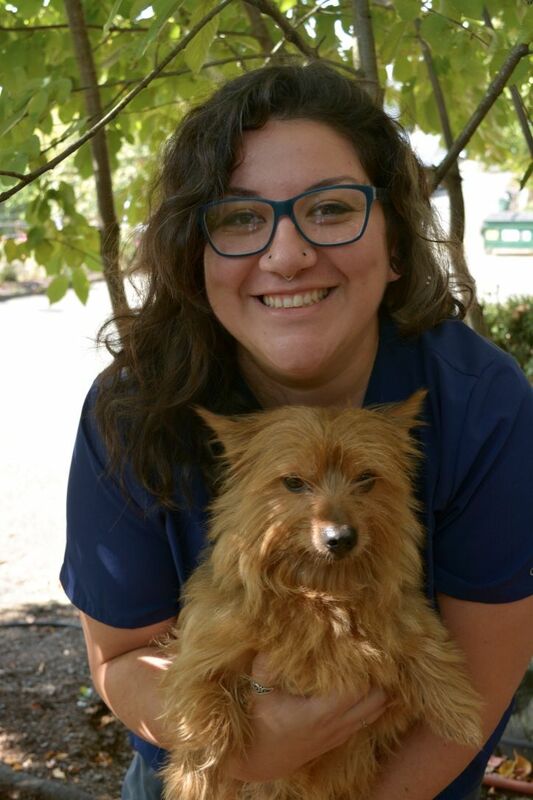 Ashley, aka Crashley or Smashley, is our Reception Supervisor and started working at Pacific Veterinary Hospital in the summer of 2000 as a Kennel Attendant. Since then, she has been cross-trained for a number of positions at the hospital from accounting to technician. At a very early age, she was always rescuing animals in need. Today, she enjoys working with animals and the people who love them! When she is not at the hospital, Ashley enjoys spending time with her husband Ryan and daughter Alisha. She also likes to paint, hike, bike, camp, create glass art, and do just about anything outdoors! She has a great fondness for horses too! Ashley has two dogs - Kona, a Heeler mix, and Franco, a German Shepard mix; Chixie, Chexter, and Chopie are her chickens as well as her three domestic longhair cats - Opie, Trixie, and Dexter. 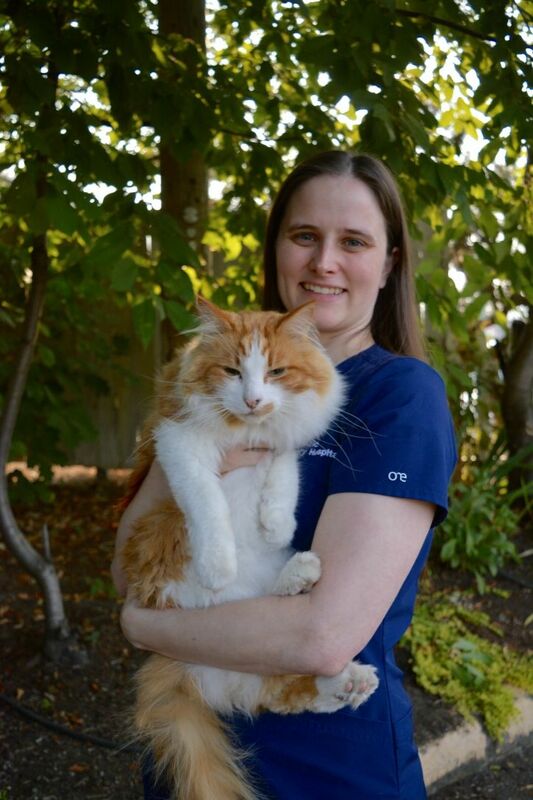 Laura has been working at Pacific Veterinary Hospital since 2011. Born and raised in Portland (in this neighborhood no less! ), she has a husband and a young son named Freddy! Laura studied art and print making at PSU and when not at work, Laura’s hobbies include music, sewing, baking, print-making and knitting. You can usually catch her at Christmas time making cat-themed block prints! 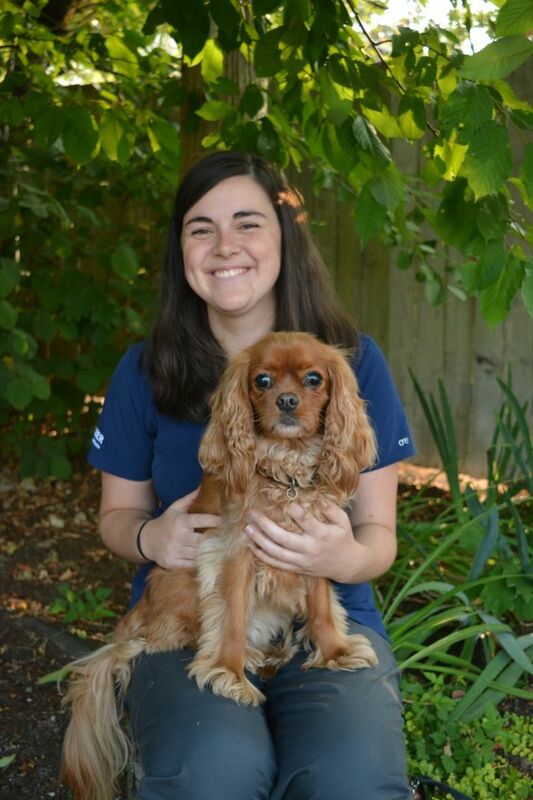 Laura loves working in reception at PVH because she gets to meet all of the clients and their four-legged family members! 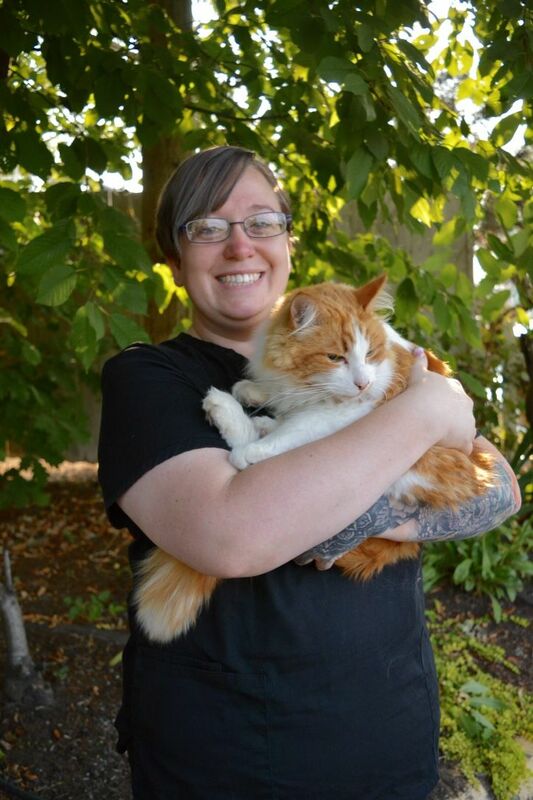 Laura is very fond of kitties and joined forces in the summer of 2017 with the Feral Cat Coalition raising a momma and 5 feral kittens in her own backyard and then finding them a home! Julie, aka Jules, is our Practice Manager at PVH! Prior, she worked for Hills Pet Nutrition as a Supervisor for the Inside Sales Team out in Topeka, Kansas. After one year in Topeka, she knew it was time to head back home to the Pacific Northwest and Portland, where she was born and raised! 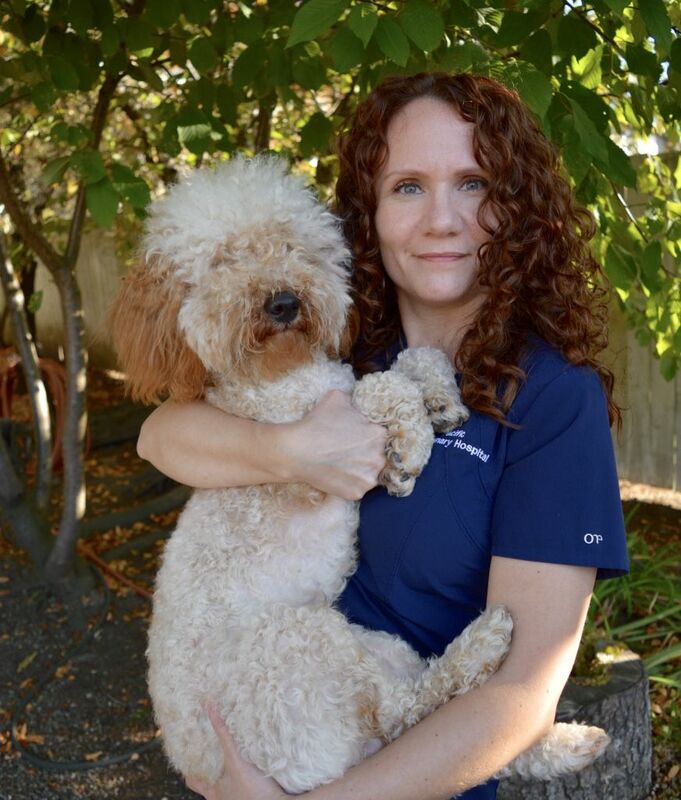 She initially developed her relationship with PVH when she worked as a sales representative for a veterinary distribution company selling food, drugs, and supplies to Dr. Ron Schmidtke, who previously owned the practice before Drs. Frost and Grossen purchased it. Jules has been married to her husband, Craig, of 37 years and has two children, Ashley andChrisopher plus three grandsons, Hunter, Dylan and Dallas and one granddaughter, Ali. 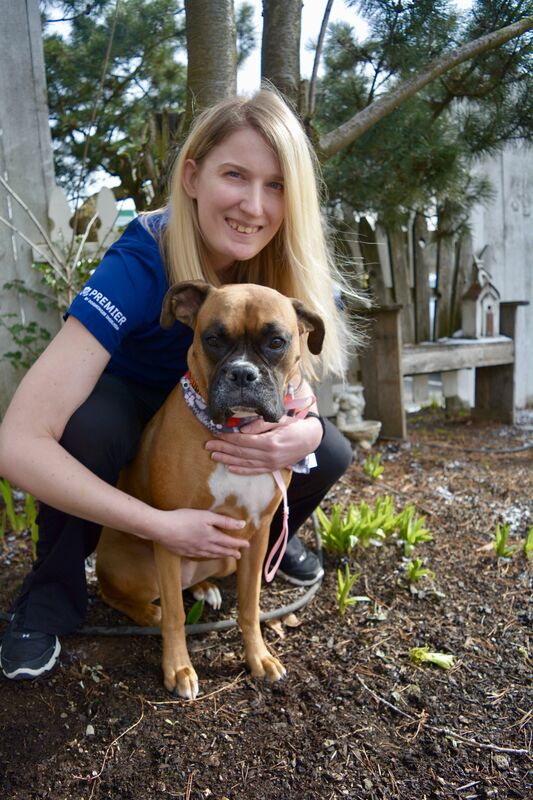 Her rescued boxer Addi (short for Attention Deficit Disorder Individual) hangs out at the hospital and when not snoozing, greets our clients with a wiggle or two! When not at work, Julie enjoys creating fused and stained glass art, glass mosaics, water color painting and gardening. 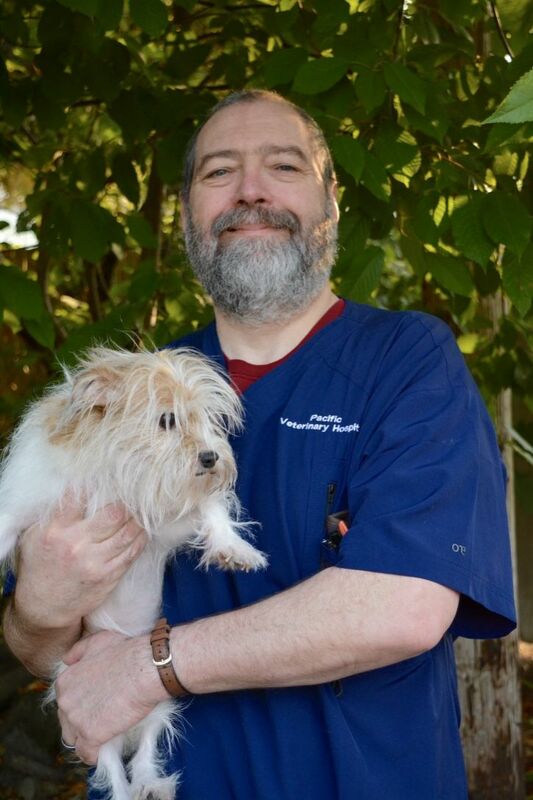 Walt, is one of our Veterinary Technicians at PVH; he has been a vet tech for over 25 years, 15 years in the field of oncology! He was born and raised in New York/Long Island and enjoys fly fishing when he gets the opportunity. He has a dog named Lucy and seven felines to keep him busy - Lulu, Hami, Dinky, Pasha, Luke, Lucy andToulouse. Walt has a lifelong interest in Veterinary Oncology. Michelle is one of our Receptionists at PVH. She was born in Panama CIty, FL, lived in Knoxville, TN for 30 years and now resides in the Portland area with her husband Jeremy, and her two cats - Booda, a grey Siberian and Parsons, a Tuxedo - and loves it! She earned her Associates Degree in Marketing and a BA in Sociology at the University of Tennessee. Her interests outside of work include relaxing with her kitties and exploring the city and restaurants (she's a foodie!) with her husband. Shelby is one of our Room Technicians, born and raised in the Portland area. When she's not working, Shelby likes to do arts and crafts, baking and gardening. Jen was born and raised on a farm in Sacramento, CA where her family took in and rescued an array of farm animals. Jen likes hiking, adventure napping and really loves butterflies! She is also NVPCI certified. 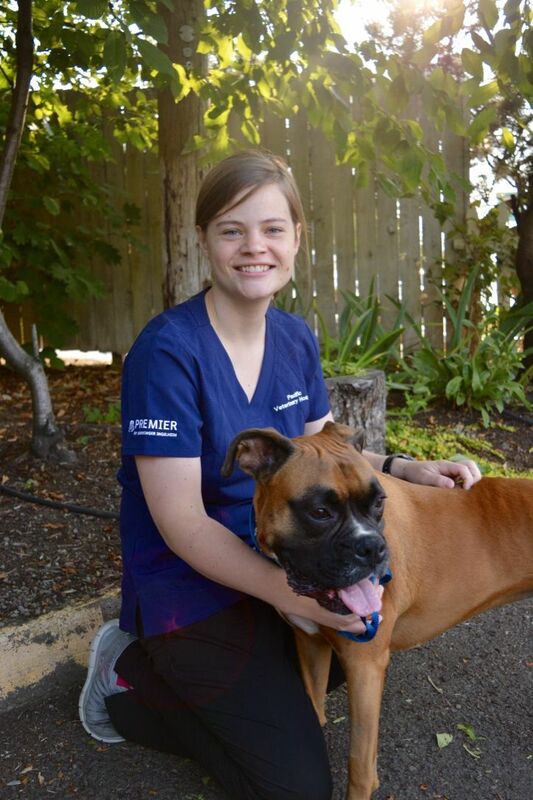 Emily is a Veterinary Assistant at Pacific! She was born and raised in Vancouver/Washougal, WA. Emily lives with her partner, Scott, and they are over the top excited to be expecting their first baby, a boy, in late October. She likes to skateboard, read, play video games, hike and swim during her down time. She has one Siamese kitty named Simba! Donna is known around here as the "Money Lady". She was born & raised in Fallbrook, CA and attended West Linn HS, PCC, and on to OSU. Her first visit to PVH was when she was 10 years old! She has now worked at PVH for a little over 20 years. She's worked every department position except as a doctor, which was her childhood dream. She has been married for 36 years and has raised a son and daughter. SHe enjoys hiking, camping, kayaking, Nascar/racecar racing. 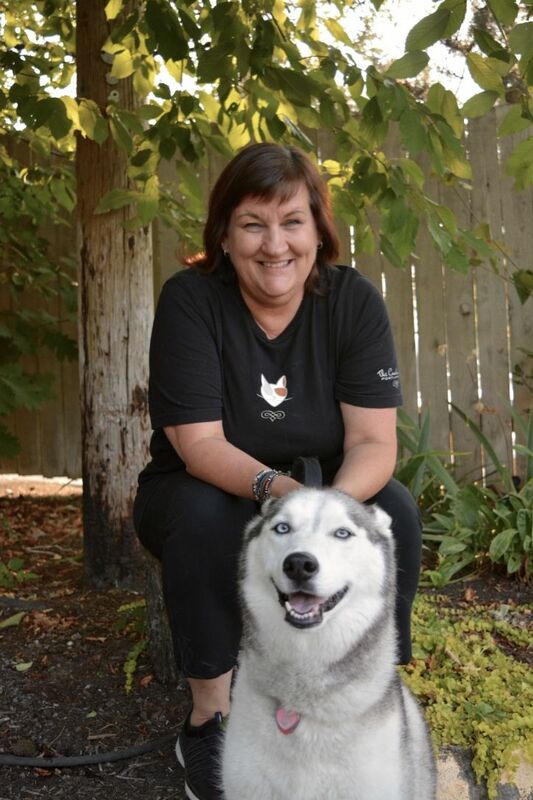 SHe's pictured here with Rogue, her sweet Siberian Husky and she also has a Firebelly Toad at home named Frog. 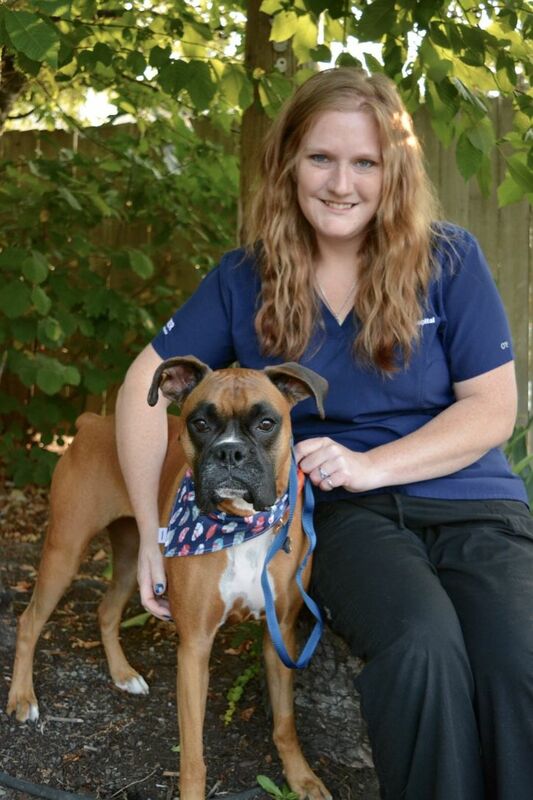 Danielle is our Lead Technician and one of our Certified Veterinary Technicians at PVH! 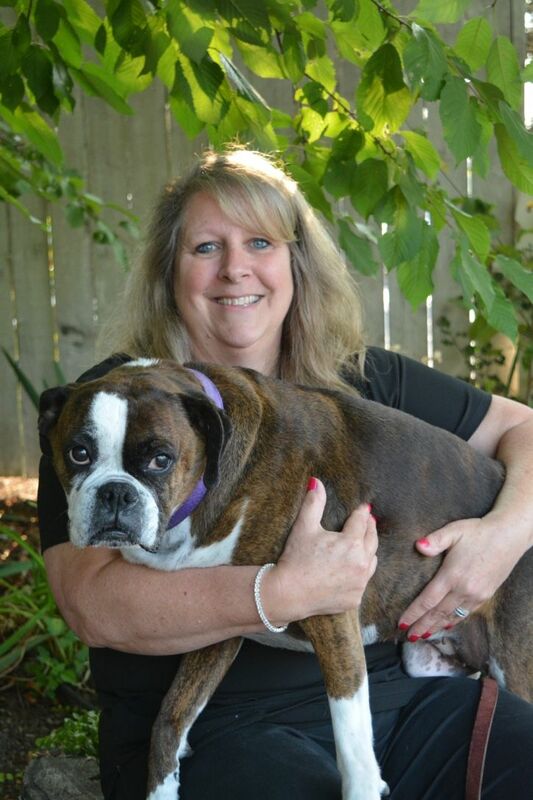 She has been a CVT for over 20 years and her interests at the practice include anesthesia and pain control. She loves general practice and seeing patients grow through all stages of their lives. Outside of work, she enjoys camping and is currently focused on learning French! She lives with her husband, two daughters, one son, a Standard Poodle named Strut and a mini-Poodle named Theo. 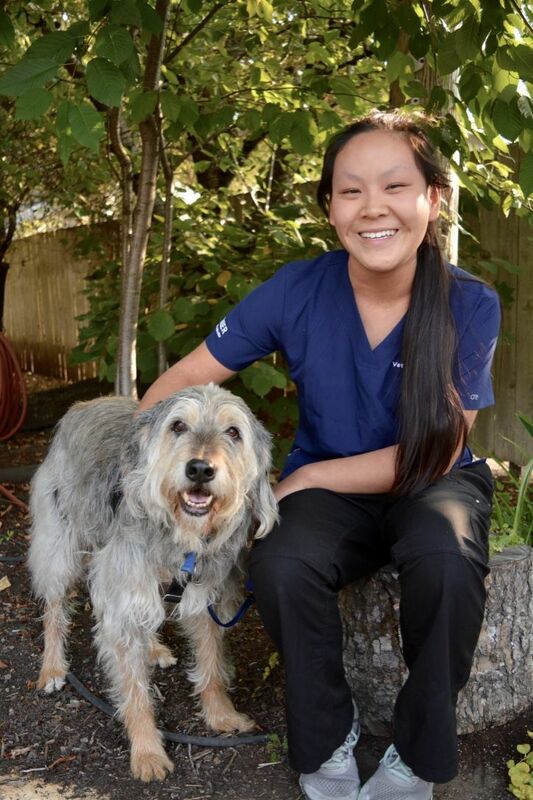 Ana Meng is a kennel attendant at PVH! She has been involved in animal rescue for the past five years. She has an Airedale mix named Hayley and a Leopard Gecko named Emma! When she isn't working with animals, you can find her in the crowd at Thorns soccer games, exploring tide pools of the Oregon coast or riding Space Mountain at Disneyland! She also speaks Spanish fluently and assists with any translation needs at the clinic. Amanda is a Receptionist and Room Technician at Pacific! 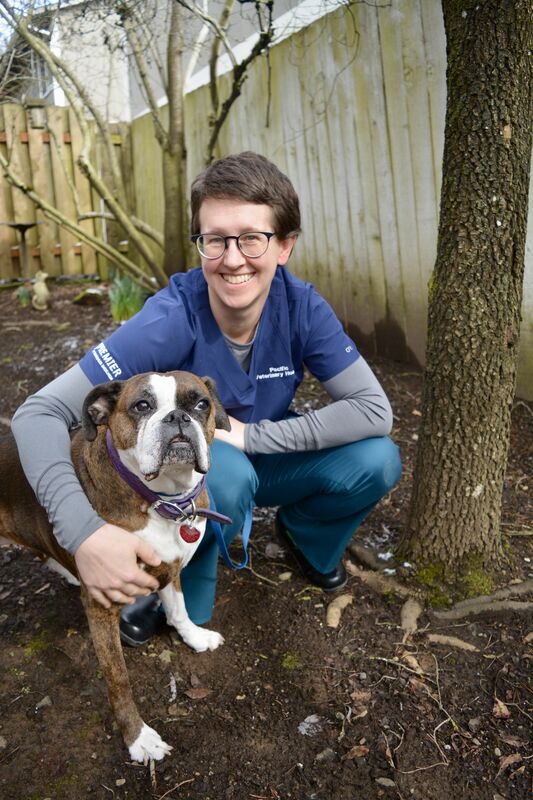 She earned her Veterinary Assistant certification from Carrington College. She was born and raised in Vancouver, WA and enjoys reading Popular Science Magazine. She's a former US Marine who also likes hiking, camping, collecting tattoos, working on her writings, photography, music and a project car. Arlene has been greeting clients as a receptionist at PVH since 2015. Arlene, aka the Queen, the talking machine, also does a lot of our social media too! She was born and raised in Battle Lake, MN. When not at work, she loves sewing and shopping for fabrics, and also spending time with her family - her husband Nick and sons Adam and Avery. She loves Frenchies and is pictured with her two - Sophia, 7 years old, and Sebastian, who's 1 year old! 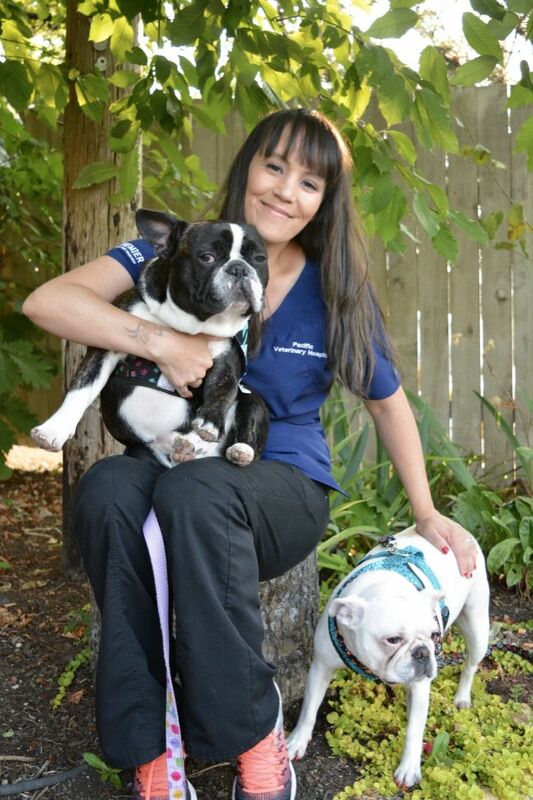 Aka Brit, Brit graduated from Carington College and earned her Certified Veterinary Assistant, CVA, certificate. 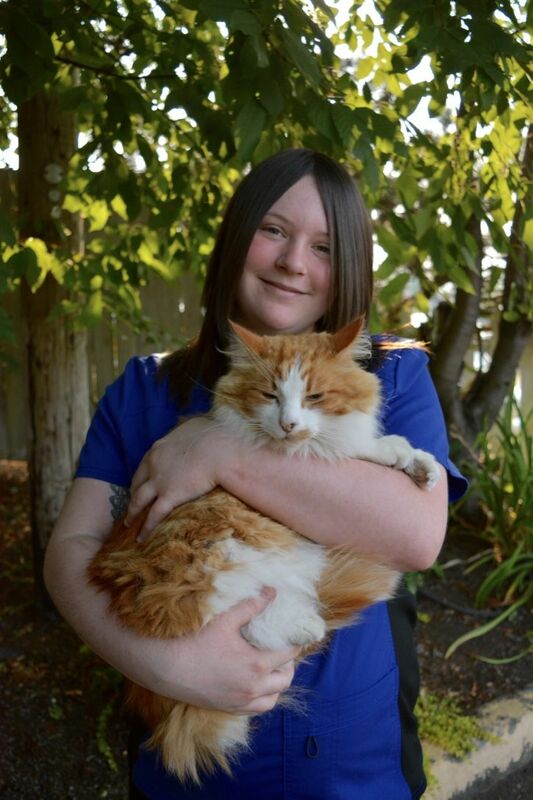 She is now attended Penn Foster school and studying to become a certified Veterinary Technician. Brit was born in Connecticut and raised in Oregon. She enjoys hiking, fishing, taking her 10-month old New Foundland pup, Lona, to the lake or river, plus reading and learning everything she can about veterinary medicine. She is an advocate for pet adoption and likes teaching people bits of information they may not know about animals. She also has a sweet 8 yr. old short hair cat named Miss Stache.